Teaching a dog training class is a creative challenge. The best classes succeed in two fronts: They deliver the best of modern dog training practices, and they provide an environment where both dogs and people thrive.Easy to say, but tough to do consistently. So how can you make it all work? How can you structure a class so that the dogs and the people do their best, no one is left out, and everyone succeeds? In this webinar Scandinavian instructors Emelie and Eva (Carpe Momentum) give you an insight in their way of teaching group classes! Eva Bertilsson is one of the original TAGteach Faculty members. She has a master’s degree in behavior analysis and a passion for all things related to behavior, learning and animal welfare. Together with business partner Emelie Johnson Vegh, Eva runs their collaboration Carpe Momentum. 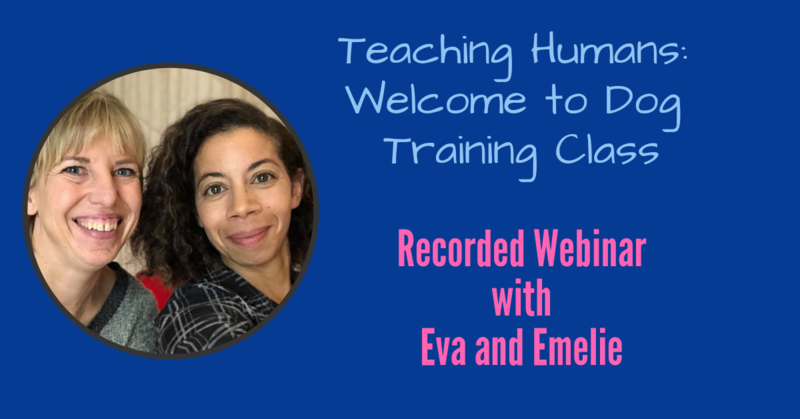 Eva and Emelie's goal is to help people acquire knowledge and skills in science-based, modern, humane and empowering teaching strategies for the benefit of learners of all species. They teach seminars on the general principles of behavior and learning, and coach trainers in the art of structuring great training sessions regardless of the venue or the species. Their book Agility Right from the Start was published by Karen Pryor Clicker Training (KPCT) in 2010, and outlines Emelie and Eva’s philosophy and structured approach to training, making it a worthy read not only for agility enthusiasts. E&E are part of the Clicker Expo faculty. In addition, they are TAGteach Faculty and introduced TAGteach to Scandinavia in 2005. They offer consultations and workshops about applying positive-reinforcement based strategies with human learners in all imaginable areas. Eva is a board member of the Swedish Association for Behavior Analysis, and works to connect the communities - teaching behavior analysis to animal trainers, and teaching animal training strategies to behavior analysts working with people. She is also active in building a Fear Free™ veterinary care community in Scandinavia, and is the initiator and host of the Scandinavian CCC conference (where the three C:s stand for Choice, Control and Communication) . Emelie is one of the original members of the TAGteach Faculty. Emelie’s great interest lies is teaching, whether it’s private lessons for clients with dogs, group classes, running coaching, creative writing with kids… The list goes on. Together with business partner Eva Bertilsson, Emelie runs their collaboration Carpe Momentum. Emelie and Eva’s goal is to help people acquire knowledge and skills in science-based, modern, humane, and empowering teaching strategies for the benefit of learners of all species. They teach seminars on the general principles of behavior and learning, and coach trainers in the art of structuring great training sessions regardless of the venue or the species. Their book Agility Right from the Start was published by Karen Pryor Clicker Training (KPCT) in 2010. The book outlines Emelie and Eva’s philosophy and structured approach to training, making it a worthy read not only for agility enthusiasts. ”E&E” are part of the Clicker Expo faculty. In addition, they are the first TAGteach faculty in Europe and they introduced TAGteach to Scandinavia in 2005. They offer consultations and workshops about applying positive reinforcement based strategies with human learners in all imaginable areas. Emelie lives in Malmö in the south of Sweden together with husband, three children and two dogs, Scout, a kelpie, and field golden puppy Tessa. Together they enjoy many outdoor activities and dog sports.